We’re real stoked to be able to premiere ‘Again’, the latest serving of electro-pop psychedelia from Melbourne’s warped pop masterminds Messy Mammals. ‘Again’ is a charming slice of synth drenched electro-pop madness, delivering big time on the wit and unpredictability we’ve come to expect from Messy Mammals. The duo, comprising of Asha Trips on vocals and bass and Fionn Brewer on guitars and production, have once again treated us to layers upon layers of smooth vocals and an array of warped synths, this time with a hint of summery vibes just at the right time of year. The bands psychedelic tendencies are also enhanced by the playful, collaborative clip accompanying the song. 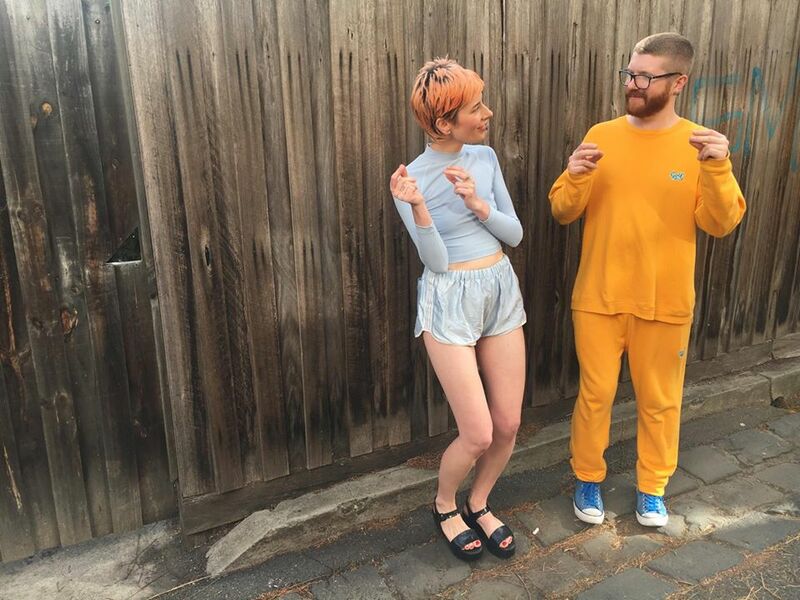 This year has already seen the Melbourne duo release a handful of music and gig relentlessly, but with this new clip (and another 3-track EP late December?!) Messy Mammals prove they aren’t done with 2017 yet. We caught up with Asha from Messy Mammals to get a glimpse into their busy year and all things ‘Again’. TJ: Tell us a bit about who Messy Mammals are. MM: It's Fionn and me! It's our individual ideas joined together into one big galaxy of ideas! It's all of our expressions, passions, inspirations, experiences, frustrations, perceptions, and lives basically, poured into one project. It's a never-ending journey of levelling up and growing and creating! Messy Mammals is also our friends, our family, our collaborators, all the amazing ones who have been involved so far. ‘Again’ is everything we’ve come to love about Messy Mammals. What’s the story behind the new single? Haha thanks! 'Again' is a song we recorded a few months back (around the same time as 'Orchids'), which we have played live at our last few shows, but we really hoped to release it with a visual. The idea behind the song is kind of the breakdown of a relationship; however it is done very playfully I guess, which I know is kind of weird lol. To explain it more clearly: the vocal in the intro is talking about being at the beach, and feeling super happy, but then dropping your ice cream on the ground and just wanting to cry; that kind of childish free bliss that melts away into that childish irrational upset. So that is the energy we wanted to carry throughout the whole track. The video was a collaboration with three boss women: Shanni Dalton (my amazing mama, who filmed and edited the video), Bronny Gardiner (our dopedopedope beloved pal, who styled the video), and our shining star and beautiful friend Crystal Webb (who dances like a boss in the video). They all facilitated our weird ideas, and we are extra grateful! The video also stars and is dedicated to our family's beloved doggo, and family member, and dearest little pal and ray of sunshine, Dougie! It's about his adventure out of his humdrum apartment, to dress up and go and visit his musical pals in the street and have a nostalgic and fun time ahaha. It is a big love-filled project. Messy Mammals have released a bunch of music this year following quickly on from album in 2016. Where does the inspiration come from to slam out so much new music? We have wanted to really push ourselves and keep creating and growing! It has been hard at times, but it has also been cool and fun and we'll probably never stop cos we thrive off change, and drink too much coffee and are too impatient. On the topic, you’ve also got another 3-track EP coming out in a few weeks? What else is coming up for Messy Mammals? A cheeky little special performance up at Woodford (with my amazing sister Kylie), a January residency at the Yarra Hotel in Abbotsford, cassette tapes for 'Connection Lost! ', and some more video collaborations for 'Connection Lost!' in the early months of 2018. Annnnd thennnn many more collaborations with our amazing friends and fellow artists, both locally and around the world. Check out ‘Again' above, and follow the Mammals on Facebook to try and keep up with all they've got going on.